Born in Jerusalem in 1976, Yael Ronen is one of the most intriguing directors of her generation. 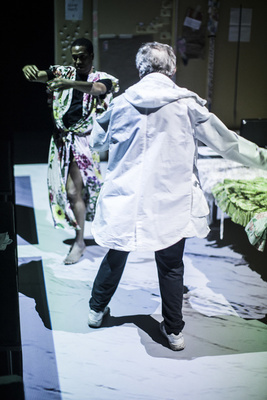 Hakaoh Berlin, developed at Schauspielhaus Graz, was awarded the Austrian Nestroy Theatre Prize in 2013. 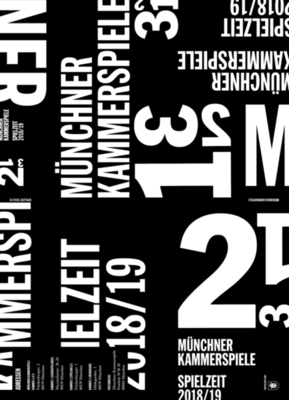 Common Ground, a meditation on the aftermath of the war in former Yugoslavia, was invited to the renowned Theatertreffen Festival at Berlin and won the audience award at Mülheimer Theatertage in 2015. 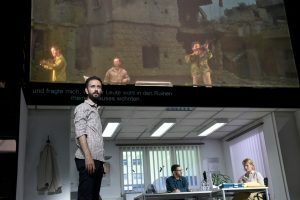 Her production The Situation at Gorki Theatre was invited to the Theatertreffen in 2016. 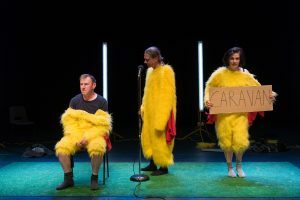 Sheffield based Forced Entertainment was founded in 1984 and consists of Artistic Director Tim Etchells, Designer / Performer Richard Lowdon, and performers Robin Arthur, Claire Marshall, Cathy Naden, and Terry O’Connor. The company’s provocative performance style, for example, in Speak Bitterness or Quizoola, has vastly influenced a whole generation of British, European, and North-American theatre artists. in 2016, Forced Entertainment received the Ibsen Award, the most renowned theatre award in Europe, and in 2017, their production Real Magic was invited to the Berliner Theatertreffen as one of the ten outstanding productions in the German-speaking world. This is a perfect extraction; after outsourcing a part of my mind into my book, I have now outsourced my body, too, and can let it do tours and all the unpleasant stuff. Tonight writer Thomas Melle is holding a lecture on instability. However, the speaker is not Thomas Melle himself but a copy in the shape of a humanoid robot. 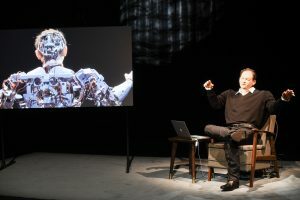 Stefan Kaegi of Rimini Protokoll, an award-winning company focusing on documentary theatre, explores the consequences of putting a humanoid robot on stage. What are the reactions of Thomas Melle himself and of the audience? Can this kind of performance still be described as “theatre”? Director Christopher Rüping had always felt detached from ancient Greek drama. The chorus, the language, and the role of fate created an artificial world that had nothing to do with our reality. When watching Greek drama, he found that he began to be engaged by the play only when it was almost over. When those dramas were written, they were presented at the Dionysia, a drama competition (Agon) that went on for five days. Dionysia were ecstatic festivals with free wine and free food, starting early in the morning and going on until late at night. Christopher Rüping knew he could not recreate the Dionysia but he decided to be bold and to present a tetralogy, composed of three dramas and one satyr play. Ten hours of theatre would allow his antique drama to unfold. Morning in Byzantium is the second Kammerspiele Production by New York director and choreographer Trajal Harrell. Whereas Juliet & Romeo focused on youthful death, Morning in Byzantium sees the end of life as only one of various possibilities, and the director chooses life. Justice is “out” and immortality is “in”. Artistic Director Matthias Lilienthal presented the new season together with directors Christopher Rüping, Susanne Kennedy, and Trajal Harrell in June. Whilst the press were enjoying Lebanese pizza and wine, Lilienthal announced thirteen new productions for 2018/19 of which seven would be world premieres. Argentinean documentary director Lola Arias, who is best known for her theatre work, recently presented her debut film Teatro de guerra at the Berlin Film Festival. Related to her play Minefield that opened at the Royal Court Theatre in 2016, followed by a world tour, the film features six war veterans from the UK and Argentina who re-enact their experiences and relive their trauma of war together. A master of documentary fiction, Arias is interested in personal stories in a larger historical context, and for her new production she has chosen a highly relevant subject indeed. 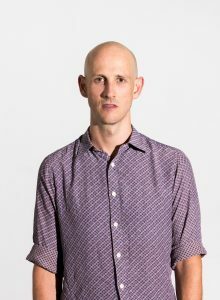 Damian Rebgetz, born in Darwin, Australia, has been a member of the Kammerspiele ensemble since 2015, playing such diverse roles as Yasha in The Cherry Orchard and das Fräulein in Mittelreich. With his background in classical music and music theatre, Rebgetz’s desire to present a lieder recital did not come as a surprise. Yet the material he had chosen was rather unusual. Courtesy of Tien Nguyen The. Polish singer, actor and director Marta Górnicka began developing her concept of a new modern and tragic choir theatre at the Zbigniew Raszewski Theatre Institute in Warsaw. In 2010, Górnicka founded her “Choir of Women”and her first production This is the Chorus Speaking, which added a political dimension to her work, premiered in Warsaw the same year, followed by the award winning production Magnificat, which toured internationally. With the rise of the #MeToo movement and angry white men who want to turn back the clock to the good old days of gender inequality, plays discussing the war of the sexes have been produced in theatres all over Germany. 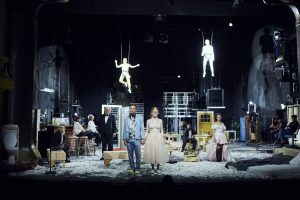 Nicolas Stemann, resident director at the Kammerspiele chose August Strindberg‘s first naturalistic play The Father to contribute to this discussion.